But promoting democracy in other nations in recent decades has not been a top priority for the American public. 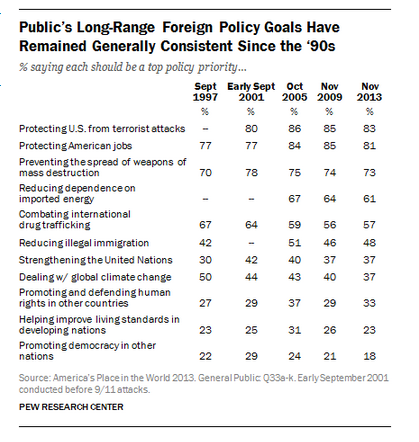 A new Pew Research Center survey on “America’s Place in the World” found that just 18% of those surveyed cited this as a top foreign policy objective, putting it at the bottom of a list of priorities. Since 1993, the share of Americans saying promotion of democracy was a top priority has never topped 29%. Just under three-in-ten (27%) Democrats saw promoting democracy abroad as a priority, with much less support coming from Republicans (16%) and independents (13%). This sentiment has become particularly pointed when it comes to the situation in the Middle East and North Africa after the Arab Spring uprisings beginning in 2010 against authoritarian regimes gave way to turmoil in many of the affected countries. A survey conducted in Oct. 2012 pointed to the disillusion that had set in. Those believing the Arab Spring would lead to lasting improvements dropped from 42% in April 2011 to 25%, and along with that change, the U.S. public began putting less importance on democracy in the region than in having stable governments. That view is even more pronounced in the latest survey than it was last year: 63% now put more importance on stable governments while 28% see democracy as a priority.